There can be a lot of mistakes when filling in GST challan for making GST Payment. You may also end up paying excess GST due to this. This excess amount is shown as a balance in the Electronic Cash Ledger. The excess GST paid can be claimed as a refund within 2 years from the date of payment. This means that if excess GST is paid in the month of November 2017, GST refund application can be submitted until November 2019. Step 1: Login to GST Portal. Step 3: Select ‘Refund of Excess Balance in Electronic Cash Ledger’ and click on ‘CREATE’. 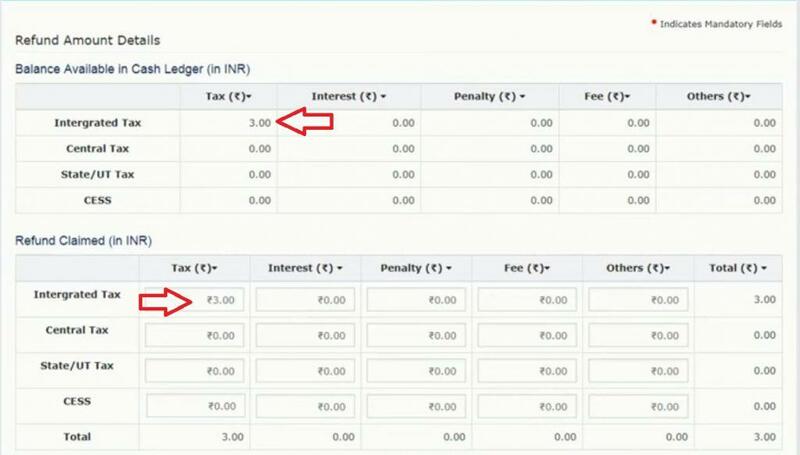 Step 4: Once you click on ‘CREATE’ in the above step a screen will appear reflecting all balances in the Electronic Cash Ledger which can be claimed as refund. You can enter values of the refund to be claimed in the editable ‘Refund Claimed’ table. Step 5: Select the Bank Account (in which you want the refund to be credited) from the drop-down and click on ‘SAVE’. Step 6: Click on the checkbox in the declaration. Select the name fo the ‘Authorised Signatory’ from the drop-down. Once RFD – 01 is filed Refund ARN Receipt is generated in PDF format. After inspection by a GST officer refund will be credited to the bank account.